By modern standards, nineteenth-century photography can appear rather primitive. While the stark black and white landscapes and unsmiling people have their own austere beauty, these images also challenge our notions of what defines a work of art. Photography is a controversial fine art medium, simply because it is difficult to classify—is it an art or a science? Nineteenth century photographers struggled with this distinction, trying to reconcile aesthetics with improvements in technology. Although the principle of the camera was known in antiquity, the actual chemistry needed to register an image was not available until the nineteenth century. Artists from the Renaissance onwards used a camera obscura (Latin for dark chamber), or a small hole in the wall of a darkened box that would pass light through the hole and project an upside down image of whatever was outside the box. However, it was not until the invention of a light sensitive surface by Frenchman Joseph Nicéphore Niépce that the basic principle of photography was born. From this point the development of photography largely related to technological improvements in three areas, speed, resolution and permanence. The first photographs, such as Niépce’s famous View from the Window at Gras (1826) required a very slow speed (a long exposure period), in this case about 8 hours, obviously making many subjects difficult, if not impossible, to photograph. 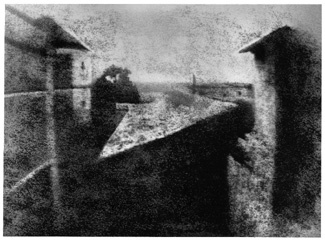 Taken using a camera obscura to expose a copper plate coated in silver and pewter, Niépce’s image looks out of an upstairs window, and part of the blurry quality is due to changing conditions during the long exposure time, causing the resolution, or clarity of the image, to be grainy and hard to read. An additional challenge was the issue of permanence, or how to successfully stop any further reaction of the light sensitive surface once the desired exposure had been achieved. Many of Niépce’s early images simply turned black over time due to continued exposure to light. This problem was largely solved in 1839 by the invention of hypo, a chemical that reversed the light sensitivity of paper. Photographers after Niépce experimented with a variety of techniques. 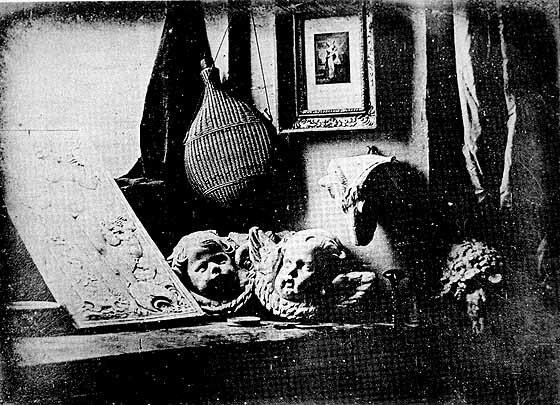 Louis Daguerre invented a new process he dubbed a daguerreotype in 1839, which significantly reduced exposure time and created a lasting result, but only produced a single image. At the same time, Englishman William Henry Fox Talbot was experimenting with his what would eventually become his calotype method, patented in February 1841. Talbot’s innovations included the creation of a paper negative, and new technology that involved the transformation of the negative to a positive image, allowing for more that one copy of the picture. 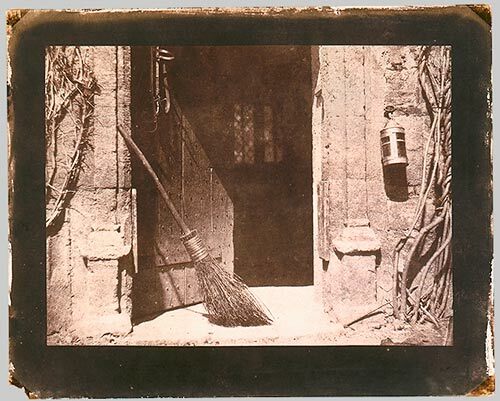 The remarkable detail of Talbot’s method can be seen in his famous photograph, The Open Door (1844) which captures the view through a medieval-looking entrance. The texture of the rough stones surrounding the door, the vines growing up the walls and the rustic broom that leans in the doorway demonstrate the minute details captured by Talbot’s photographic improvements. The collodion method was introduced in 1851. This process involved fixing a substance known as gun cotton onto a glass plate, allowing for an even shorter exposure time (3-5 minutes), as well as a clearer image. The big disadvantage of the collodion process was that it needed to be exposed and developed while the chemical coating was still wet, meaning that photographers had to carry portable darkrooms to develop images immediately after exposure. Both the difficulties of the method and uncertain but growing status of photography were lampooned by Honoré Daumier in his Nadar Elevating Photography to the Height of Art (1862). 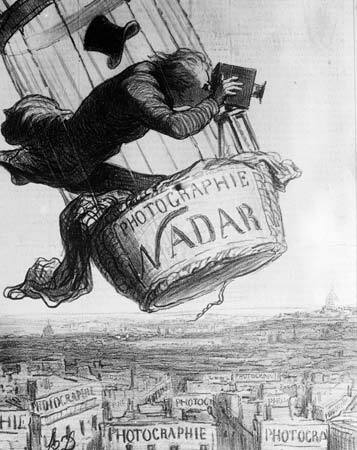 Nadar, one of the most prominent photographers in Paris at the time, was known for capturing the first aerial photographs from the basket of a hot air balloon. Obviously, the difficulties in developing a glass negative under these circumstances must have been considerable. Further advances in technology continued to make photography less labor intensive. By 1867 a dry glass plate was invented, reducing the inconvenience of the wet collodion method. Prepared glass plates could be purchased, eliminating the need to fool with chemicals. In 1878, new advances decreased the exposure time to 1/25th of a second, allowing moving objects to be photographed and lessening the need for a tripod. 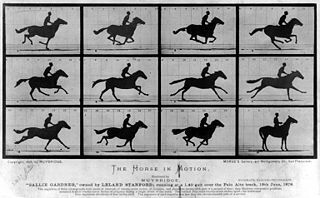 This new development is celebrated in Eadweard Muybridge’s sequence of photographs called Galloping Horse (1878). Designed to settle the question of whether or not a horse ever takes all four legs completely off the ground during a gallop, the series of photographs also demonstrated the new photographic methods that were capable of nearly instantaneous exposure. Finally in 1888 George Eastman developed the dry gelatin roll film, making it easier for film to be carried. Eastman also produced the first small inexpensive cameras, allowing more people access to the technology. Photographers in the 19th century were pioneers in a new artistic endeavor, blurring the lines between art and technology. Frequently using traditional methods of composition and marrying these with innovative techniques, photographers created a new vision of the material world. Despite the struggles early photographers must have had with the limitations of their technology, their artistry is also obvious. Cite this page as: Dr. Rebecca Jeffrey Easby, "Early Photography: Niépce, Talbot and Muybridge," in Smarthistory, August 9, 2015, accessed April 19, 2019, https://smarthistory.org/early-photography-niepce-talbot-and-muybridge/.